The scriptural plan of salvation is the backbone of our faith. It rests fully on The Lord Jesus Christ’s finish work on the cross. There is no substitute for it and there is no work that we can do to earn it. 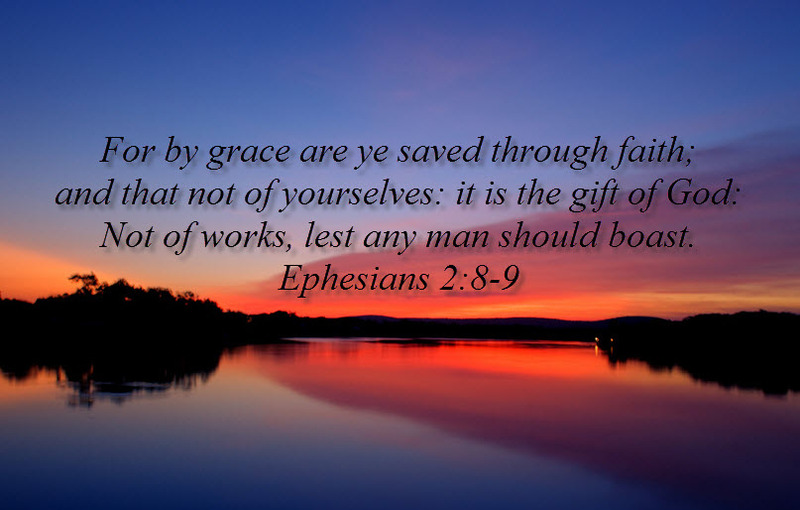 Salvation is by grace through faith, plus nothing, minus nothing (Ephesians 2:8-9). It is a free gift. “For God so loved the world that he gave (emphasis added) his only begotten son…” If someone gives you a present, all you have to do is take it to make it yours. And so with salvation by grace it is a free gift. Let me share with you some scriptures that show the clear step by step plan of salvation as we find reflected in the scriptures. The first step is to understand that we are all sinners. Romans 3:23 states, “For all have sinned, and come short of the glory of God;” We have all done something, actually many things, that are not right. Even one little lie or one impure thought are enough to bar the way to heaven. There is no one perfect in the world. How do we know? Because the Bible says so right here. The second step is to realize that we need a remedy for sin, a solution to our sinful state. That solution is Jesus Christ. Romans 6:23 reads, “For the ways of sin is death; but the gift of God is eternal life through Jesus Christ our Lord.” The payment for our sin is death and spending eternity in hell. But the gift of God, Jesus paying the price for our sins on the cross, means we have eternal life if we ask him into our hearts. For you see without the shedding of blood there is no remission of sins. Hebrews 9:22 says, “…and without shedding of blood there is no remission.” Jesus lived on this earth for just over 30 years and never once did he sin. The Bible calls Him a lamb without spot or blemish. So how does one go about asking Jesus Christ to come into your heart? By simply praying and asking Him to. Some people like to have a sample salvation prayer to follow. While just reading a prayer does not do it, you must really mean it in your heart and believe for Christ to extend salvation to you. If you pray this, or something similar in your own words, salvation is yours. The Bible promises that once we are saved we are His sheep. We can never not be His sheep, any more than you can remove yourself from your biological family and no longer be a child of your parents. Our salvation is once, for all, and forever! John 10:27-30 is a very good passage of verses for new Christians to memorize. It reads, “My sheep hear my voice, and I know them, and they follow me: (28) And I give unto them eternal life; and they shall never perish, neither shall any man pluck them out of my hand. (29) My Father, which gave them me is greater than all; and no man is able to pluck them out of my Father’s hand. (30) I and my Father are one”. While this scripture is full of promises I want to point out that once we are in Jesus’ hand we are also in the hand of God. And no one can take us out of that. So no matter how bad life gets we always have our salvation if we accept Jesus Christ into our hearts as our Lord and Savior. Whether you are a new Christian or one who has been saved for 50 years, it is always good to look back to the cross and remember when you got saved. If you are not a born-again Christian, I encourage you to realize that you must be born again. There is no substitute for salvation by grace. Without it you will spend an eternity in hell where the fire is no quenched, darkness, burning, gnashing of teeth, and eternal separation from God. Please call us if you are unsure of your standing before God. We would be happy to answer your questions and share salvation scriptures with you.